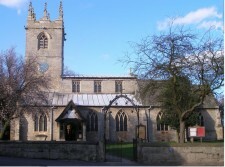 St Peter's Church, Clayworth, is open all day, everyday for you. It is God's house and everyone is welcome. It is home to the Traquair Murals, the largest work of art in the East of England, painted by the eminent Scottish artist Phoebe Traquair in 1904/5. The church also features a fine 13th century stone screen - a rare possession in a village church, and the Elizabethan Fitzwilliam tomb, one of the earliest examples of decorative plasterwork in the country. A visit is highly recommended - we are open all day, every day to welcome you. Services are held on Sundays, mostly at 11am, and on Thursdays at 9.30am, and you will find service times and details for this month and next elsewhere on the website.